292 pages | 15 B/W Illus. "Matti Tedre’s The Science of Computing: Shaping a Discipline examines three broad historical debates about the nature of computing … Tedre gives a balanced treatment of each debate, attending to the intellectual and institutional dimensions, as people sought funding from the NSF, aimed at disciplinary identity, and struggled to create educational coherence." "… the author takes readers on a historical journey that starts before Leibniz, Pascal, and Boole. … includes extensive supporting documentation and an excellent index. Summing Up: Recommended. Upper-division undergraduates through professionals/practitioners." "This is a terrific investigation of the philosophical issues around the nature and history of computer science, examining whether it is a science, and, if so, what kind of science it might be." 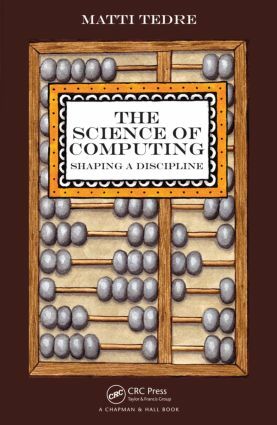 "Written with insight, exceptional clarity, and command of the facts, The Science of Computing: Shaping a Discipline provides a timely and much-needed account. Following a historical development of the discipline, from its strong relation to mathematics and engineering, it elaborates on computing as a science of both the artificial and the natural. Must-read for anyone interested in understanding the computing discipline." "Critics of computer science (CS) have long claimed that CS is engineering and mathematics, but not science. Laying bare the historical records of the field, Matti Tedre demonstrates that science and the experimental method have been part of CS since the beginning. Moreover, CS has always been interested with supporting all fields of science with methods that aid scientific discoveries and cope with the increasing quantities of scientific data. Read this and you will understand CS better." "Unlike some other books concerned with aspects of the disciplinary formation of computing, 6 this book was written by a computer scientist. Moreover, the intended readership of the book is first of all computer scientists. The main ambition is thus not to write a history book. Nonetheless, and as Tedre acknowledges, it is neessary to engage with the existing historiographical literature given the topic. As a consequence, the bibliography contains many references to the works of professional historians of computing like William Aspray, Martin Campbell-Kelly, Edgar Daylight, Nathan Ensmenger, Thomas Haigh, and Michael Mahoney. Combined with the analysis of a large number of original sources from some of the major actors concerned with the disciplinary content of computing—such as Edsger Dijkstra, Peter Denning, Tony Hoare, Donald Knuth, Herbert Simon, and Peter Wegner—this book is certainly also an important contribution to the historical literature on computer science, especially since there are hardly any works on this topic." "In his excellent book on the shaping of the computing discipline, Matti Tedre observes that CS can be viewed from scientific, mathematical or engineering perspectives. It is good to see a book that unravels the mystery of Computer Science for both those in the discipline and those outside it."